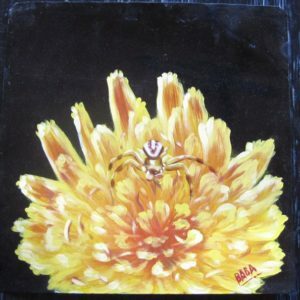 The spider on the golden flower is by the artist Baba. 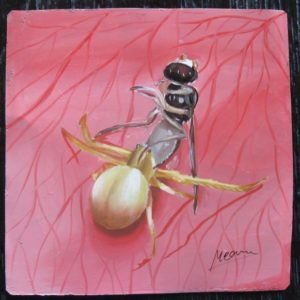 This beautiful portrait of a spider by Megh Raj just sings with its vibrant detail and gorgeous ripe melon background. Sanjib Rana has really captured this 4-eyed spider. 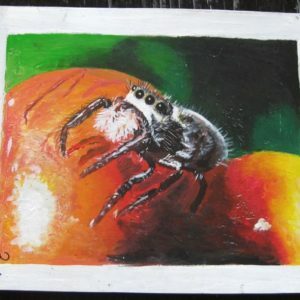 This one is a dramatic choice for spider lovers everywhere. As is the case in all of Sanjib’s artwork, these are acrylic paint on metal and therefore is not for outdoor use. Every other artwork on the site can be displayed outside.